Climbing up from the port, between Banchi and San Matteo, you will reach Campetto. Its name is reminiscent of the time when it was a small cultivated garden outside the city walls. For a certain period, it was called Campo dei fabbri (“Blacksmith field”, translator’s note) and named after the workers who had a shop in this location. This was the centre of the Imperiale family; along with the Gian Giacomo Imperiale palace, which is in direct connection with Piazza S.Lorenzo, Ottavio Imperiale’s palace is also here. It is called Palazzo del Melograno – today it hosts a department store – and still preserves a nymphaeum with a statue of Neptune on the ground floor. Close to Banchi are two alleys presenting interesting names: Vico delle Mele and Vico dell’amor perfetto (“Apple Alley” and “Perfect Love Alley”, translator’s note). The former was inhabited by noble families and its buildings still show the magnificence of that time. Their interiors were decorated by the greatest Genoese and foreign artists. The facades still present the sign of the locks that were used for tying the horses, which further proves that they were built a long time ago. The latter was the home of the Finamore family, who had been listed in the Usodimare hotel starting from the 16th century. However, the origin of the peculiar name is unknown even today. A popular legend links it to a sad love story, whilst others attribute it to the brothels in the area. Via S.Luca also begins at Banchi. Wonderful buildings from the 16th century can be found. Their majestic appearance can hardly be contained in such a narrow street network. This shows the difficulty as well as the evocative effect of adding new structures to pre-existing architectural elements from the Middle Ages. S.Luca is one of Genoa’s oldest districts: in 1188, Oberto Spinola ordered to build the family church devoted to S.Luca in the place where it is situated today. The street’s oldest buildings date back to that time, including the Spinola family’s mediaeval house-tower in Vico alla Torre di S.Luca. Starting from the 14th century, the houses of different noble families such as Spinola, Grimaldi, Lomellini, Pinelli were concentrated here. There was a portico for pedestrians, so that horses could march in the middle of the street. The route continued through Via del Campo and Via Pré, thus leading out of the walls through Porta dei Vacca towards the west and Sampierdarena. The very old S.Siro church, at the end of via S.Luca, was Genoa’s first cathedral. It was built between the 4th and 5th century and initially dedicated to the Twelve Apostles. Research suggests that it was initially located inside the urban area – a cathedral out of the city would not have made any sense – but later on because of depopulation during the Middle Ages it was situated outside the 9th century walls, while S. Lorenzo became the cathedral, in that it was more safely located within the walls. It was later dedicated to Genoese Bishop Siro, a saint who is remembered for many miracles, such as chasing the basilisk out of the well. From Campetto, the S.Maria delle Vigne church could be reached. It was surrounded by the square and alleys of the same name. As can be understood from the name (vigne means “vineyard”, translator’s note), it was built outside the city walls in an area full of vineyards which stretched from the S.Siro cathedral – outside the walls – to the Soziglia district, where a small river irrigated the fields. Built in the 11th century on a primitive church dating back to the 6th century, it was soon absorbed by the city and became a parish in 1147. It assumed an ever increasing importance in the surrounding area, as it was not only a religious but also an administrative building. Over the course of the centuries the church has been renovated in accordance with different styles (Renaissance, Baroque, Neoclassicism), but the bell tower has never been touched. Today, it still retains its Romanesque features. If you go along the dividing line between Maddalena and Molo, you will reach Via di Soziglia. The above mentioned small river used to flow here in the 12th century and a ditch led water from the nearby fontane marose (“water fountains”) into the sea. In the following centuries, the water was channeled into pipes flowing into the sea. A poultry market was situated here. In the far past, the sea would stretch as far as this location and the suffix of the ancient term suseia supposedly was derived from Persian, meaning “port”. In the same area, Via dei Macelli di Soziglia is one of many cases when a toponym directly refers to the old city’s professions and therefore to history. From the middle of the 12th century up to the 15th century, the ground floor of one of the buildings in the street was occupied by the public slaughterhouse. Via Luccoli starts from Soziglia. 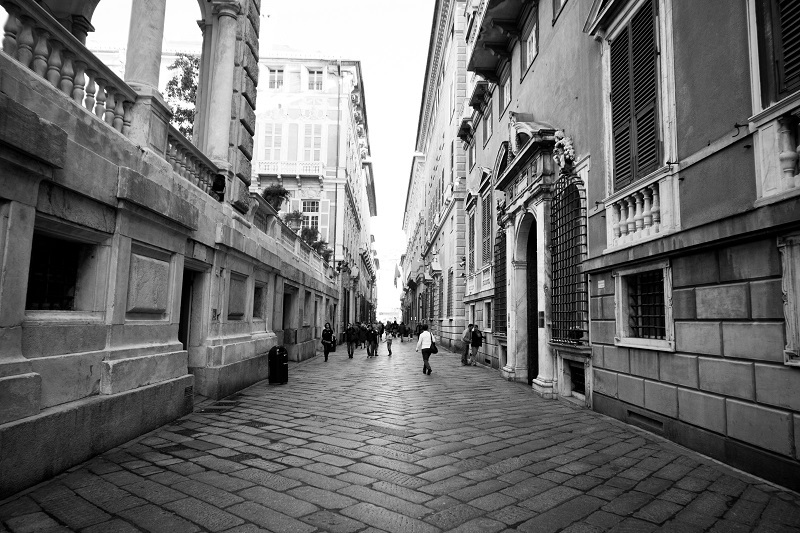 Before Piazza Fontane Marose was widened, it led directly to Salita S.Caterina. The name comes from lucus, meaning “holy forest”, which was dedicated to Diana, the woodland goddess. A large forest, initially outside the city walls, started from this location. Later on, it was included within the 16th century walls, while deforestation was performed in the 17th century. But one of the main – or maybe the main – urban revolutions in the old city took place in the 16th century with the demolition of via Montalbano and its surroundings – an area inhabited by lower classes and the public brothel – in order to host the prestigious palaces of the noble Genoese families who wanted to get away from markets and docks. This is the origin of Strada Nuova – originally via Aurea, now via Garibaldi – one of Genoa’s centre’s most precious pearls. Its artistic value and pristine buildings make it a priceless monument in history. Twelve out of forty-two Genoese palaces listed among the Rolli (UNESCO World Heritage Site) can be found in via Garibaldi. The purpose of the Rolli system was to provide hospitality to prestigious individuals at the time of the Republic. The Rolli were paper rolls containing the list of palaces belonging to noble families which complied with the required standards for the accommodation of eminent guests. Different categories were listed: the more prestigious the guest the higher the category of the palace and family that had the honour – and the burden – of hospitality. With its distinctive features, Strada Nuova inaugurated modern urban architecture in Europe. During his visit to Genoa, Pieter Paul Rubens made accurate sketches of Strada Nuova which were published in 1622 under the title “Genoa’s Palaces”. They made Genoa and its architecture known all over Europe. Today, via Garibaldi hosts the Strada Nuova museums and the seat of the local government, which was moved to Palazzo Tursi in 1850. Almost parallel to via Garibaldi is Via della Maddalena, more central and older than Strada Nuova. The area is named after the church of the same name and its origin dates back to a very distant past. It was mentioned in Caffaro’s annals because of a fire occurred in 1140. The street was part of a route leading out of the city, whilst the mediaeval brothel that was moved to Castelletto due to renovation works in the 16th century was probably not too far from the church.